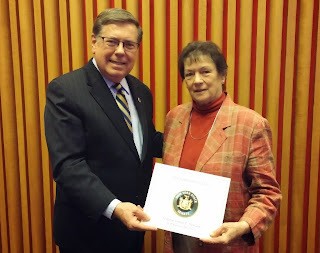 ALBANY, 05/11/15 -- State Senator James L. Seward (R/C/I – Oneonta) recently congratulated New York State’s top senior citizens as part of the New York State Office for the Aging 2015 Senior Citizens Day Celebration in Albany. Schoharie County citizen honoree Ruth Bradt. WHEREAS, These senior citizens have contributed to the State by building and helping preserve the customs, traditions and ideals of the many ethnic groups that make up the mosaic of New York State. “I also have to give credit to the local county office for the aging staff members that work so hard on a daily basis providing crucial services to area senior citizens and advocating for their needs,” Seward added. “These honorees exemplify the great commitment, experience, and care that so many other senior citizens bring to their communities. We would be lost without their expertise and I am truly impressed with their great accomplishments,” Seward concluded.